I’ve been having fun making earrings with lampwork glass head pins. Basically this means that a glass artist formed the molten glass around a thin metal wire. For example, in the earrings below, Susan Kennedy of Sue Beads, created the mango colored rounds with a thin vertical metal wire sticking up from the top. I strung on the blue ceramic beads and topped them with small carnelians. Then I wrapped a loop with that wire at the top and attached it to the brass ear wires. I love these cheerful earrings. They’d be awesome with jeans, but they’d go with anything blue, brown, beige, rust or orange. I titled these the “Mango Delight” earrings and they are in my shop now. 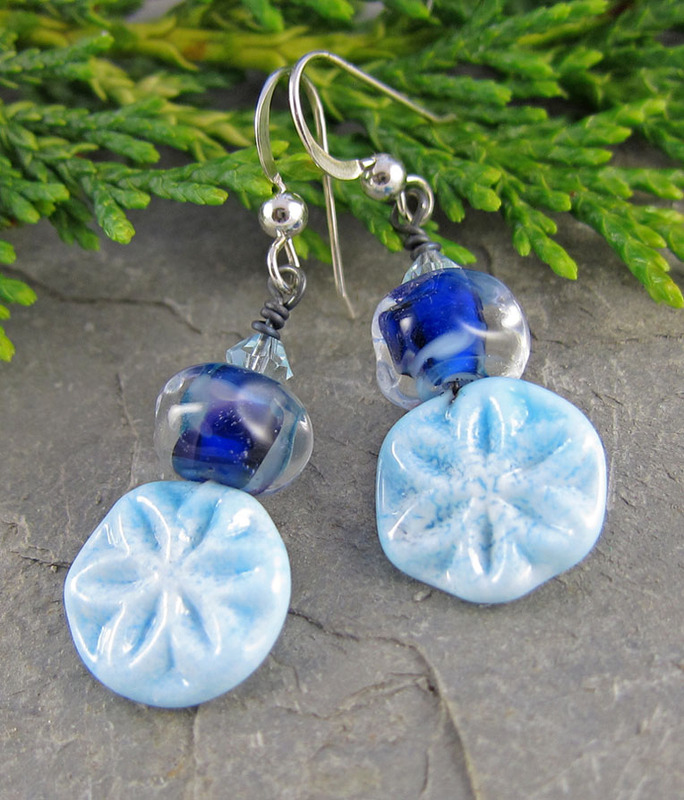 This next pair of earrings also features glass head pins from Sue Beads. 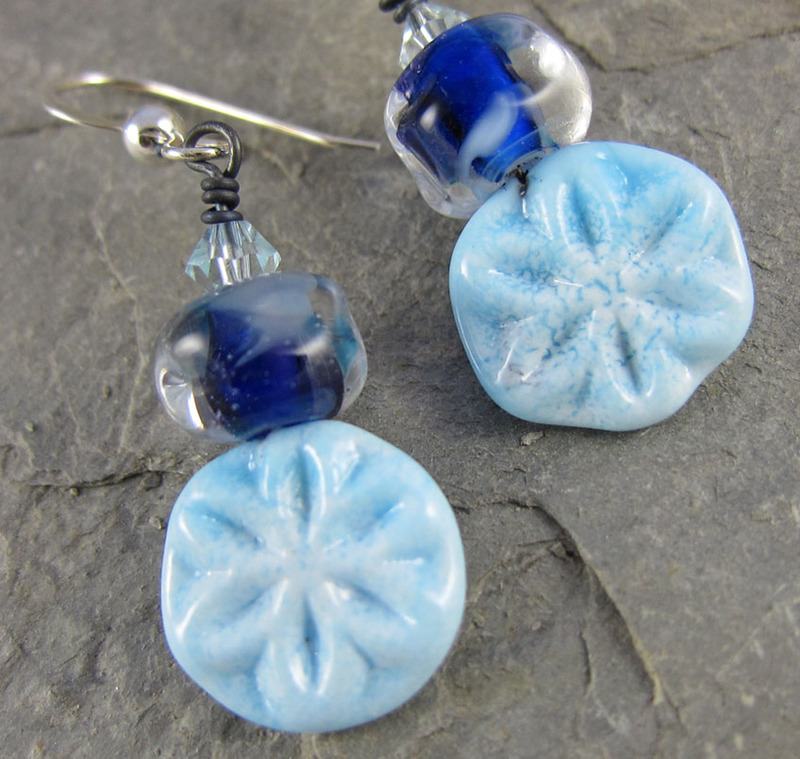 Sue called these blue rounds “Snow Flowers” and you can see why. The pattern that has been pressed into the glass could be interpreted as either a flower or a snowflake, making them a great year round choice. I topped the glass head pins with lampwork glass (handmade glass) by another talented glass artist, Jenelle Aubade of Beads and Botanicals. When you peer into these beads they are miniature wonders, full of swirling baby blue, cobalt blue and clear glass encasing. I topped Jenelle’s beads with light blue Swarovski crystals. The ear wires are sterling silver. The “Crystal Blue” earrings are also in my shop now. This entry was posted in Jewelry and tagged bead blogs, Beads and Botanicals, earrings, handmade, lampwork glass, Linda Landig Jewelry, Sue Beads by Linda Landig. Bookmark the permalink. Very pretty Linda! You made my headpins look great!